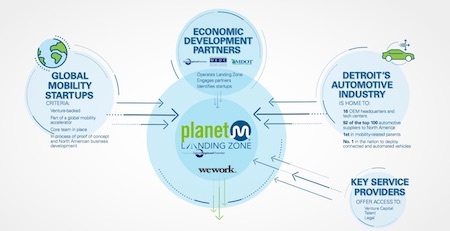 The Detroit Regional Chamber, Michigan Economic Development Corp., and WeWork today announced the launch of the PlanetM Landing Zone, which will serve as an environment for connected and automated transportation startups to connect with Detroit’s automotive and economic development network. Ford Motor Co. is the first automaker to join the partnership via its City Solutions team, located on-site. The ideal company for the PlanetM Landing Zone is a startup, either domestic or international, interested in bringing connected or automated technology to the North American automotive ecosystem. The initiative will be housed at WeWork’s Merchant’s Row location in Detroit. Located at 1449 Woodward Ave. (southwest corner of Woodward and Clifford St.), it is part of a global shared workspace company, operating more than 160 locations in 52 cities and 16 countries. The PlanetM Landing Zone will occupy 40-50 workspaces with room for up to 20 companies during its first year of operation. Selected companies will have access to WeWork locations globally, including WeWork space in the 1001 Woodward Building in downtown Detroit, and a direct connection to the Michigan Economic Development Corp. through its PlanetM and Pure Michigan Business Connect program, which links local and global purchasers with suppliers of Michigan goods and services. The Detroit Regional Chamber will also house staff members on-site to provide services to the firms, helping them connect and grow more quickly throughout the market. Additionally, the PlanetM Landing Zone will provide connections to the automotive industry and service providers. “Our region must be overly competitive in next generation mobility. To complete this ecosystem, we need to attract more tech pioneers and entrepreneurs to our region,” says Sandy Baruah, president and CEO of the Detroit Regional Chamber. As part of the project, a soft-landing zone was developed for the space. It was inspired by fact-finding missions in high-end tech markets active in the automobility space, including Silicon Valley, Israel, and the Netherlands. The PlanetM Landing Zone will be a hub to cultivate and deliver connections between early-stage firms in these markets that are eager to access the North American automotive industry centered in Detroit.